The What: Extron Electronics has introduced the XTP II CrossPoint matrix switchers with a 50 Gbps digital switching backplane, delivering the highest level of performance in the industry, according to the company. The XTP II can deploy AV system infrastructure with a switching bandwidth exceeding the data rate required to distribute 4K/60 video with 4:4:4 chroma sampling at 16 bits per color. Extron's XTP II Crosspoint matrix switchers. The What Else: The platform supports 4K video while providing additional bandwidth to accommodate future video resolutions and formats. These matrix switchers can be configured with a variety of boards, including the recently introduced XTP II HD 4K PLUS input and output boards, which support HDMI 2.0 and HDCP 2.2, or any of the existing products in the XTP Systems family. The Bottom Line: XTP II CrossPoint matrix switchers are engineered to exceed the bandwidth required by HDMI 2.0 and DisplayPort 1.3 signals. 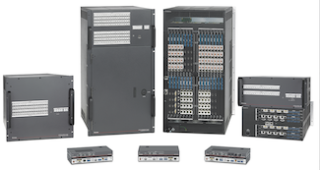 Three modular frames are available for 16x16, 32x32, as well as larger 64x64 I/O sizes; they can be configured with XTP II HDMI input and output boards, offering HDMI 2.0 performance with a full 18 Gbps data rate throughput at each port. The XTP II boards are also HDCP 2.2 compliant, ensuring reliable switching of encrypted, 4K video content. To streamline integration, all products within XTP Systems are compatible with one another. This enables complete end-to-end system solutions, and provides a range of possibilities for future system upgrades to support emerging video standards and formats. Watch a product introduction video.